Just in time for Halloween/Samhain is a lovely witchy coloring book, Color & Conjure with spells and commentary by Natalie Zaman and line drawings by Wendy Martin. If you’re a witch, pagan, or are interested in spells AND you enjoy coloring, then this is the PERFECT coloring book for you. In the section entitled, “How to use this book,” Natalie Zaman points out that intention and focus are of primary importance when performing spells & that coloring can be a valuable tool that helps to increase focus upon magical intentions. When you combine your intention, focus, a few well-thought-out words and perhaps some magical correspondences suddenly your coloring page becomes a powerful magical tool. Color & Conjure is not simply a magical-themed coloring book. There are other titles that fit that description. Color & Conjure combines coloring with actual spells so that your own coloring can be used in combination with candles, oils, herbs, and other tools in order to set energies into motion that help to manifest positive change in your life. Each chapter consists of 3 – 5 (mostly 5) spells with the chapter on the chakras containing seven, one spell for each of the seven main chakras. Instructions on how to perform the spell are included that cover wording, the use of candles & easily available kitchen herbs, and also suggestions as to which colors to use to color in the images based upon the meaning and magical correspondences of the colors. Instructions are very simple so even if you have no experience with spells you will be able to easily put Color & Conjure to good use. 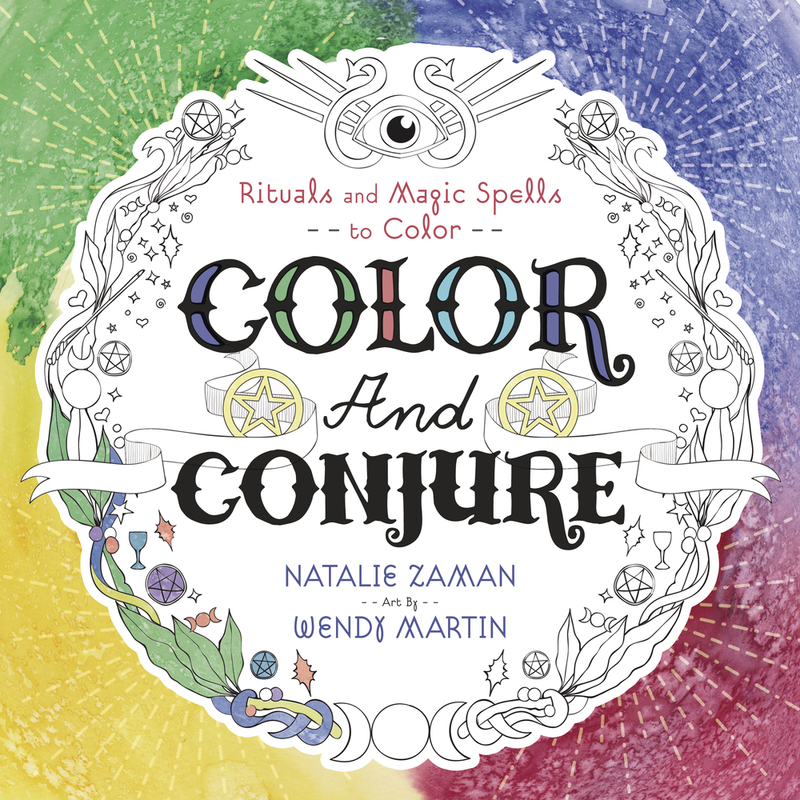 What I particularly like about Color & Conjure, other than the wonderful idea of combining spells with coloring, is that the pages on which the spells are printed always include a small version of the corresponding coloring page, which is located in full size in the latter half of the book. You can follow the author’s coloring suggestions on that smaller version of the coloring page or make up your own just to see what it would look like and then color in the main coloring page. That smaller version of the coloring page is a great place to experiment with color and artistic mediums. The type of paper used in the coloring book is the same throughout so you will know how your artistic mediums will respond on the large coloring pages by practicing on their smaller counterparts. Each chapter’s lead page also has an image you can color. Each spell includes the page number of the corresponding coloring page. For example, on page 38 the spell, “Mirror, Mirror,” which is a spell for self-love and self-appreciation has a smaller version of its corresponding coloring page on the lower left-hand side, along with a ribbon that includes a hand pointing to the words, “see coloring page 121 where you will find a large version of the same coloring image on page 38. The page numbers of the coloring pages are 1/3” from the bottom edge of the page next to the binding of the book. Each coloring page is completely perforated for easy removal for coloring and you can then set the page with your candles and other magical tools when performing the spell. Coloring pages are all printed single-sided. After the spell is completed you can bury the coloring page, burn it, or keep it in your Book of Shadows as a remembrance of the spell you performed. I really like how the page numbers are so close to the binding. When you pull the coloring page out of the book the page number remains within the book so all you have on your coloring page is the image itself. Coloring images have a ¾” border on all four sides so you can even frame these if you so desire. Wendy Martin’s use of line is quite pleasing to the eye. Line thickness varies ever so slightly throughout each coloring page that helps to emphasize some symbols over others. Many adult coloring books have highly intricate images for which you need to use something with a very fine point like gel pens. Wendy’s images have large enough areas to color that you can easily use crayons with Color & Conjure. Many adult coloring books do not work well with crayons due to the intricacy of the images. The drawings have an overall open and friendly energy to them and the compositions are all pleasing to the eye. Color & Conjure will appeal to any magically minded person who also enjoys to color, but even if you don’t, this coloring book is a great resource of very simple and easy to perform spells. I recommend it to any artistically inclined witch, but also to anyone who would like a resource of quick and simple spells. water-based markers ~ I used Tomball, Zig, and a generic no-name store brand. This paper holds up well to 4 layers of blended water-based markers. As you add a fourth layer be careful because at this point the color will begin to bleed through the page. I did attempt to use Derwent Inktense watercolor pencils. I layered 3 colors and then applied water somewhat sparingly. The paper did buckle on the colored surface as well as the reverse side of the page. Most of the buckling disappeared once the page was completely dry, but I can still feel the buckling if I run my fingers over the page; as a result, I do not recommend watercolor pencils or watercolors. Crayons and colored pencils GLIDE over this paper. I had to be careful to not run out of the lines because the crayons and pencils glide so easily and quickly. This paper also helps crayons and colored pencils to present a very level color coverage. I did not see any streaking as I applied color. Gel, glitter, and milk pens all present even coverage on this paper so I highly recommend their use for smaller areas of the line drawings. Full Disclosure: I received this book from the publisher in order to consider it for review. I only review those decks that are of interest to me & which I feel would also be of interest to my followers.